Home > Products > Mini Ganesha statue Elephant Remover Obstacles Bali Art wood carving 3.5"
Mini Ganesha statue Elephant Remover Obstacles Bali Art wood carving 3.5"
The son of Shiva and Parvati, Ganesha has an elephantine countenance with a curved trunk and big ears, and a huge pot-bellied body of a human being. He is the Lord of success and destroyer of evils and obstacles. He is also worshiped as the god of education, knowledge, wisdom and wealth. In fact, Gnash is one of the five prime Hindu deities (Brahma, Vishnu, Shiva and Durga being the other four) whose idolatry is glorified. Ganesha is known as "Remover of Obstacles" in the Hindu pantheon. 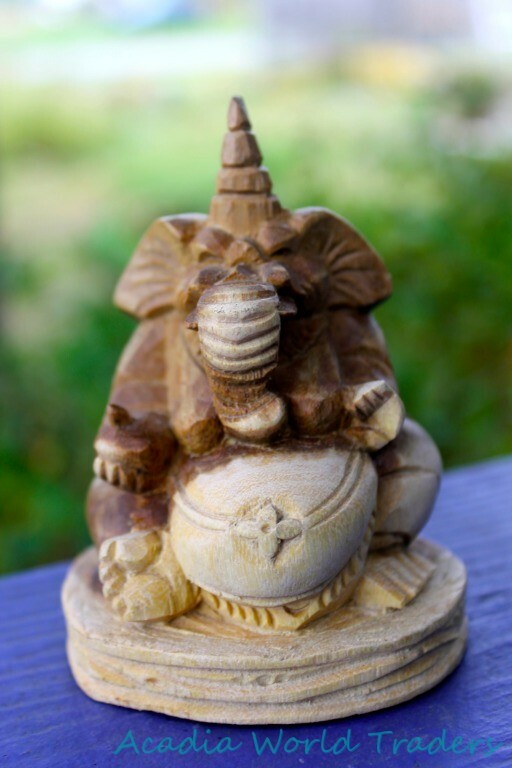 This Ganesha is hand carved from suar wood in Ubud the cultural heartland of Bali by. Small size is perfect for desk, car or personal altar. Each carving is hand made so there may be slight differences in wood grain and carving. This is not a flaw, but a reflection of the handcrafted origins of this unique product. If you have a problem with your item, please contact us to resolve the issue. We are here to work with you, your satisfaction is our #1 priority.